Version 5.6 of Kanbanize brings a new, more powerful package of Analytics. The new additions to our analytics arsenal are the result of a collaboration with ActionableAgile. The latest selection of charts and graphs will allow you to gain a more comprehensive understanding of the efficiency of your workflow by providing additional indicators for measuring data and tracking performance in a specified time frame. 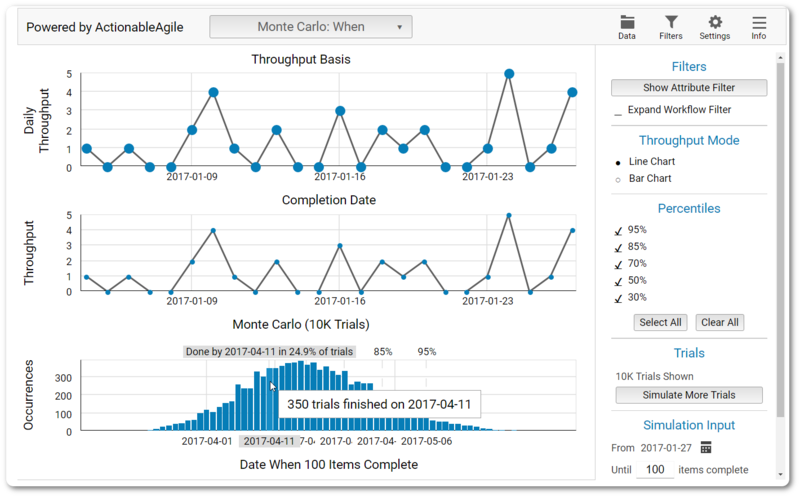 With their help, you will be able to see a cycle time scatter plot of the cards on any board and get predictions about when and how many cards will be completed based on the historical data from your workflow. In addition, at your disposal will be a throughput histogram and charts showing: cycle time, aging work in progress, and flow efficiency. This package will be available as a paid add-on to any of the Kanbanize plans. Everyone who wishes to activate the new analytics options can find out additional information about this new opportunity by contacting any member of our sales team. 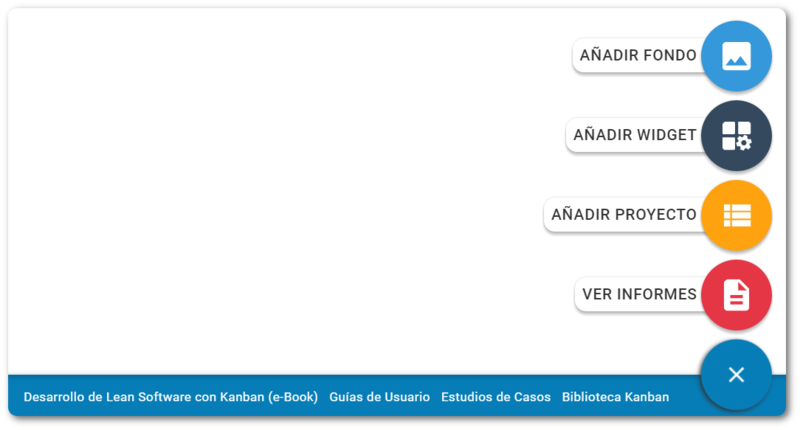 Product Update 5.6 comes packed with an internationalization option specifically tailored for the Spanish-speaking users of Kanbanize. Spanish speakers can now enjoy all of our collective platform’s features in their native language. Choose the language option that suits you best in the Account Settings menu in the top right corner of any dashboard. Click on your username, then select My Account. In the drop-down field, you’ll see the currently available interface languages (English, German, and Spanish). Choose your preference then click Save to implement the changes throughout your user account. The platform has been translated completely to bring more comfort to the way you approach increasing the process efficiency within your workflow. We welcome your feedback and suggestions for further internationalization of Kanbanize! Automating the routine tasks across your projects allows you to focus your attention towards completing more challenging assignments and making decisions. With this in mind, our team introduces a new feature that lets you transfer original card parameters to automatically-created cards via the business rules engine. Open the Administration Panel and select the Runtime Policy tab in the menu. A new pop-up window will appear and inquire whether you would like to enter the card parameters manually or transfer them automatically from the card that triggers the policy. Upon selecting the second option, the available parameters will appear. Select the parameters that you wish to transfer to the newly created card then click Apply. To complete the process, activate the policy. Our team is also introducing the first generation of interactive tutorials for new users of Kanbanize. Their goal is to take new users on a walkthrough tour of the basic and most essential features of the platform so they can begin making use of its functionality as soon as they begin working within their accounts. The tutorials cover how to create and update cards, configure card view and notification settings, as well as how to use board filters and My Queue. To access the guides, click on your username in the upper right corner of your dashboard. Select Tutorials and a popup window will appear, containing the currently available walkthroughs for you to browse. We are also happy to bring live one of our popular user requests for the ability of editing existing comments in your digital Kanban cards. Entering the Comments tab of any card will reveal a new Edit option that has been added to the menu of each existing comment. Clicking on it will provide you with the option to Edit and Delete the comment. Selecting Edit will allow you to change the contents inside. As soon as you are finished editing, apply the changes by clicking on the green check mark in the upper right corner of the comment or simply inputting the shortcut Ctrl+Enter on your keyboard. This new addition makes Portfolio parent cards a breeze to manage and track. 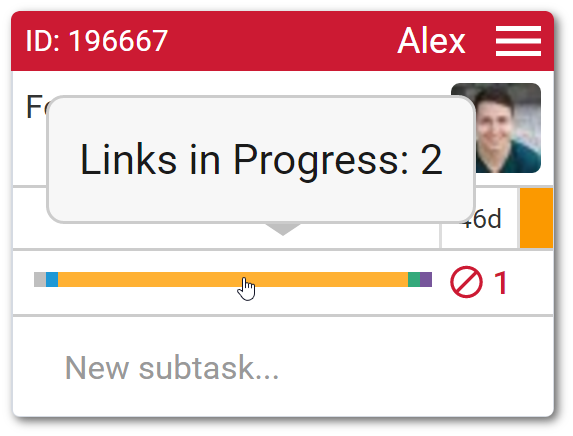 Monitor the progress of linked cards with the newly improved icon view. It will allow you to follow the progress of child cards scattered throughout the different stages of your workflow using a clear and compact status bar as part of the card view of the parent to which they are connected. To apply it, open the grid settings menu in the top right corner of any of your project boards and select Configure Card View. Click on the Show links checkbox and choose the icon view. To complete the process, save the changes and return to your project board. Ready to explore Kanbanize 5.6? We’d love to hear your feedback about the new additions. Want to see Kanbanize in your language? Add your language preference in the comments of this blog post and we’ll get back to you as soon as we can.